¡Vámonos! 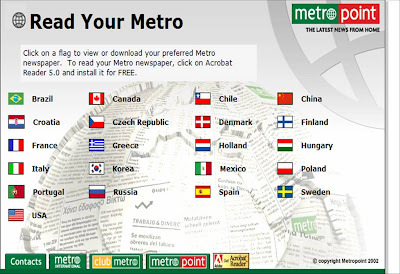 : Metro - Daily free newspaper download. I've travelled by train several times in the last few weeks and each time have acquired a free copy of Metro. I knew that there were different editions for major cities, but didn't realise that it is an international paper. A great feature is that, as well as a 'global search', there is an 'advanced search' facility, allowing you to search for a specific theme, in a specific country, region and/or time frame. I'm off to read the article about Bryan Adams on page 12 of today's Edición Nacional from Spain.